I made a recipe I’ve never made, for something I might not have thought you could make at home, and it was still compatible with having a new baby. slices we froze.) Once again, a meat adventure, because cooking several pounds of meat all at once results in lots of meals for later. I read this recipe earlier this summer, and upon looking in the freezer, realized we had a hunk of pork shoulder from our meat CSA. After it cooks for a good long stretch, you take it out of the oven, and put the chunks of meat into a container with some of the cooking fat and shred it. This is another very short operation. As long as you aren’t going anywhere for 3 or 4 hours, there are no cooking obligations for that whole stretch, and the house smells nice. Finally, when it’s time to eat you take some shredded meat, put it on a tray in the broiler – or even the toaster oven on broil if you can’t reach down right then – and let it get crispy a few minutes. Eat with tortillas, a slice of lemon or lime to squeeze, and some onion, and some salad, or it could even be a sandwich filling or pasta topping. A few months ago, I got my first try at sausage making. Soon after, I borrowed Michael Ruhlman and Brian Polcyn’s Charcuterie from the library, made salt cod from it, drooled some more over the recipes, renewed the library book, forgot to return it, paid the fine, and, concluding that the book really needed to stay on my bookshelf, went to pick up my own copy at Porter Square book. 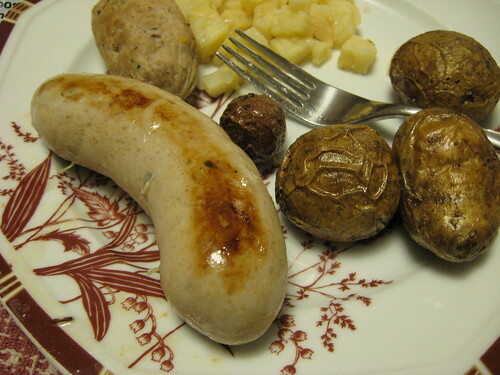 Weisswurst is a white sausage with lemon zest, mustard, mace, and parsley in the seasoning, all smooth inside with a juicy pop when you bite into it. 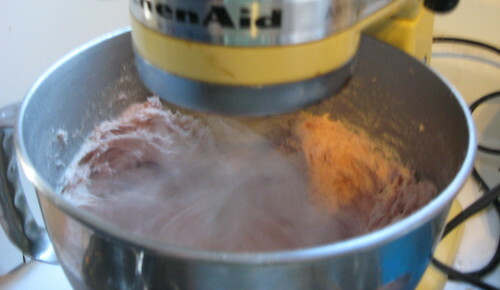 It’s important to keep it really cold while you pass it through the grinder, back into the freezer, through the grinder again with ice and salt, and then mixed up with all the seasonings, just until it forms a smooth paste which you add milk to to stabilize the emulsion. It really does create the kind of texture you expect from something a factory processed the heck out of – only with the fresh taste of real ingredients and the satisfaction of having made that ourselves. Speaking of ingredients you can trust, I’m still feeling a bit guilty for my first purchase of veal in at least 5 years… but thanks to this project I’ve learned that the next time, I don’t need to. There are farms that raise “pastured veal” or “rose veal” – calves butchered young enough to taste like veal, but allowed to roam on pasture instead of stuck in pens, and some of them are even in Massachusetts. 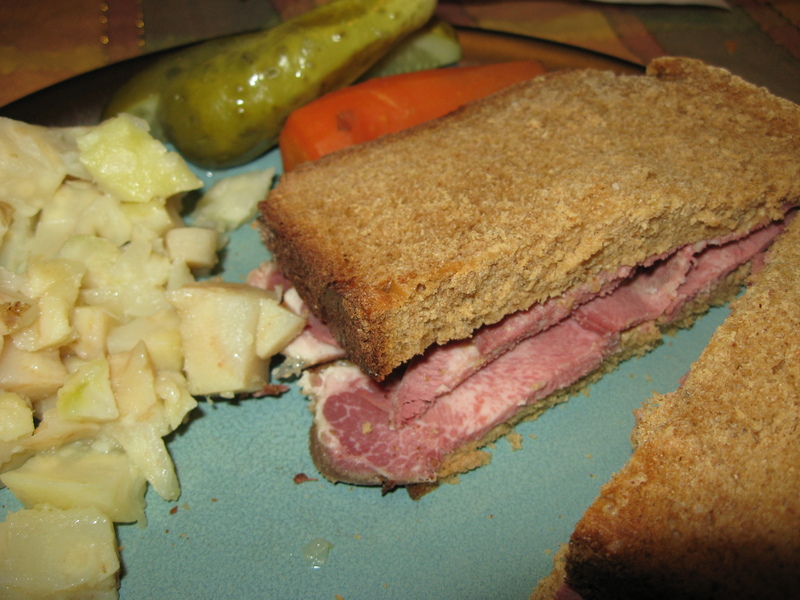 Last weekend, I started brining my first corned beef – my first adventure in home-cured meats. Only since I haven’t had it since I was a kid, and since it was a chance to get a hunk of meat from Chestnut farms for just a dollar, I brined a tongue tip, and not a brisket. I’ve been defrosting a chicken from Chestnut Farm – all of our meat from there comes frozen, and we defrost it when we need it. (Well, a few days ahead of when we think we’re going to need it… but sometimes this doesn’t work out as planned!) Unfortunately, this means that when it’s possible to get the bag of giblets out of the chicken, they have already been defrosted. So we need to use them or lose them – and so far I had mostly opted for lose them. One chicken liver is not really enough to make a decent amount of pate. This time, emboldened by a recent success with a larger rabbit liver that I turned into pate, I decided it couldn’t hurt to see what I’d get out of one chicken liver if I threw in the other unidentified bits too. I sauteed them up with plenty of salt and a little oil, then sauteed half an onion, and added a bit of water to deglaze the pan. I used a little mace, a little dried orange peel, and a little garlic for seasoning while I sauteed. With the stick blender, I blended up the giblets, onion, and liquid, along with a slice of turkey sandwich meat we had in the fridge to round out the flavor. I learned the extra meat trick from my mother-in-law, who always adds cooked chicken to her chicken liver pate. I hadn’t actually cooked the chicken yet – I guess that is why today’s planning lesson is to cook the chicken first and the pate later. The resulting pate was not as amazing as one that is largely chopped chicken livers, and I think I could actually taste the deli meat flavor coming through a bit, too, so I’d definitely wait till I’d cooked the chicken next time. Our deli meat is not so locavore as much of our food… it comes in a vacuum pack at Trader Joes and purports to be responsibly, industrially raised. There was just enough pate to spread on two sandwiches for lunch, it was simple but flavorful – a lot more flavorful than just a slice of turkey would have been! A perfectly satisfactory use of something that I hoped not to throw away, and the protein source of one more meal for two adults to boot. I wonder if I can get the farm to provide the giblets not stuffed inside the frozen bird, though. 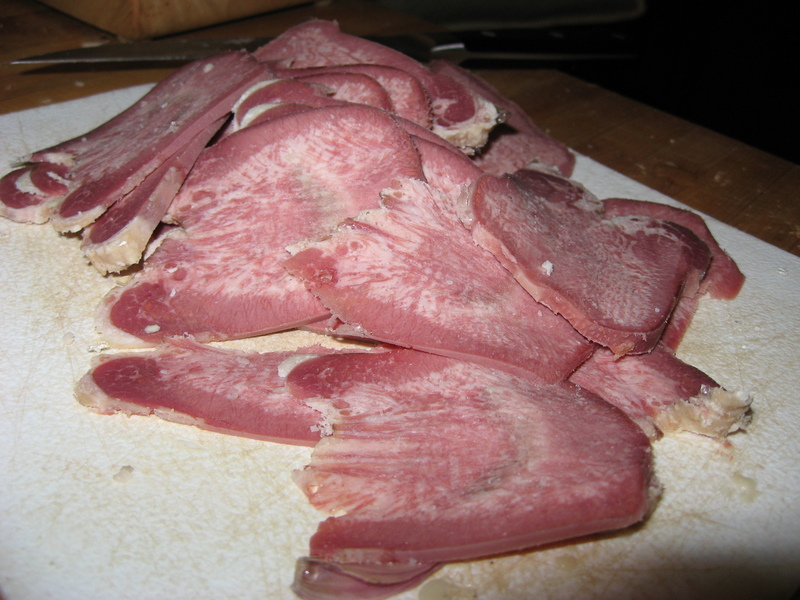 I’d still love to make a serious chopped chicken liver pate, with more than one liver at a time, someday! I often make a generic “stir fry” to which I add various Asian seasonings we stock in the kitchen regularly. It’s a great way to use some assorted vegetables from the farmshare, and whatever protein you have lying around ready to use. But I rarely try to make it from a recipe – once you get the basic idea of cooking fast over high heat, it hasn’t seemed necessary. I can’t really explain why last night I turned to the Joyce Chen cookbook we have, published in the 1960s, when Joyce Chen was doing for Chinese cooking a little bit of what Julia Child did for French cooking : “Hey people, this isn’t scary to cook and tastes good, not weird!” So by using this cookbook, I guess am being “authentic” to what Chinese people 40 years ago though American people 40 years ago would be willing to eat. Kind of like the takeout Chinese food I grew up with, but with mostly very good ingredients. The main change from the way I usually stir fry is that you cook the vegetables on their own in oil over high heat, then remove them and cook the meat together with the starchy sauce, then add the vegetables back in. The surface of the meat got that shiny iridescent look all over it, and the sauce was clearly the same brown ginger sauce as your classic takeout Americanized Szechuan Chinese food — only it all tasted more like the food it came from.